This pepper, the Carolina Reaper--the world's hottest--is beautiful bright red with a rough surface and a long stinger. But don't let its good looks fool you! This pepper got its name for a reason. If you are "stupit" enough to eat this pepper whole you may wish to enter the doors of death willingly! Be very, very careful using this pepper. Those who don't fear the Reaper are fools. Its Scoville rating is 1,569,300 SHU. Flavor has been described as sweet, fruity, with a hint of cinnamon with chocolate undertones. Uses include hot sauces, salsas, cooking, settling old scores and combat. Speedy delivery and great customer service! I was very impressed when you guys personally reached out to me after I placed my order. My seeds arrived safely in an envelope with an awesome handwritten message on it. The seeds I planted have already sprouted after just one week! 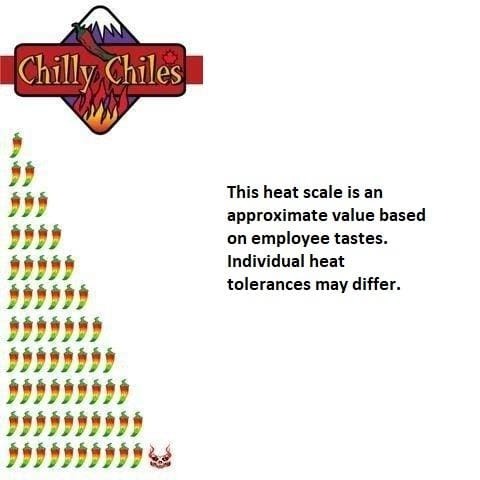 I will definitely be shopping with Chilly Chile's again, hopefully in person someday!